If you’ve ever wanted to have the experience of diving underwater—and staying there for half an hour—but aren’t sure SCUBA certification is right for you, there’s an alternative. It’s called a helmet dive. Get close to tropical fish when underwater in a helmet dive. While visiting Bora Bora one of the Society Islands in the South Pacific, we decided to try this new way of exploring the ocean floor and all the marine life to be seen below the surface. A short boat ride from our cruise ship took us to the Coral Garden, a protected open-water aquarium in the lagoon surrounding the island--which happens to be one of the most beautiful dive spots in the world. 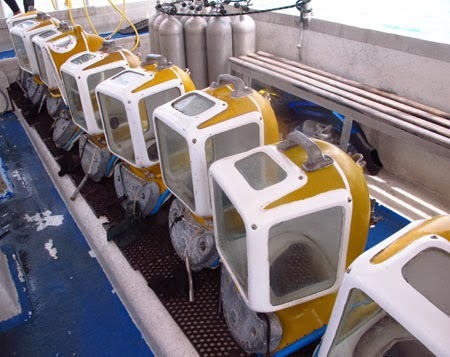 Helmets lined up and ready for us to wear underwater. After a safety briefing and instructions for equalizing pressure once the helmet was in place (swallow a couple of times), each participant in turn started down a ladder into the ocean. Because the helmet is very heavy—heavy enough to hold you 10 feet down—it is winched up and then lowered over your head, resting on your shoulders, just before you become submerged. Larry is surrounded by colorful fish--10 feet under the surface. The good news is you can wear glasses or contact lenses to see through the front glass. That was a big help for taking pictures. Also, your head—and hair—remain dry inside the helmet. Air bubbles sparkling in the sunshine rose from each helmet as people breathed normally inside. Once on the bottom we were free to wander within a roped-off area. Since each helmet is connected by an air hose to the boat, we obviously needed to stay within those boundaries. I felt the sensation of water slightly swirling gently around my shoulders, but that could have been my imagination. No water entered the helmet. Clear turquoise water allowed us to take excellent photos. 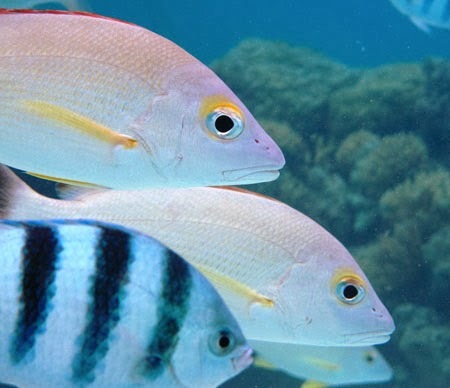 A great variety of beautiful tropical fish swam all around us—black and white striped, gleaming yellow, tiny blue, iridescent white, large black, white with splotches of pink and green—so close we could actually touch them. Of course, the small piece of bread in a mesh sack attached to the helmet was a big attraction for the fish. 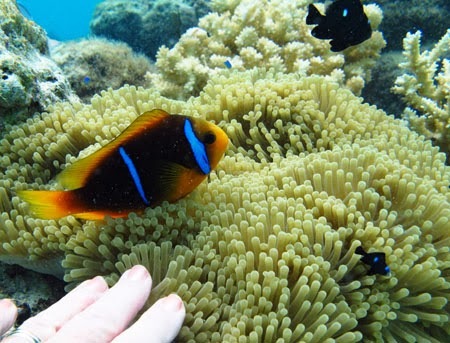 Although we’re cautioned not to touch coral for safety and environmental reasons, we were encouraged to touch one soft section of tubular orange coral waving in the current. A photographer took pictures of couples by using hand signals to match them up. After an exciting 30 minutes, we held onto the rope encircling the dive area to maneuver our lighter-weight bodies back to the boat’s ladder. Fish and fingers explore coral at the bottom of the sea. As soon as my head was out of water the helmet was winched off. On the way back to the dock, we toasted each other with a drink of fresh fruit juice. This incredible experience was much better than we had expected. 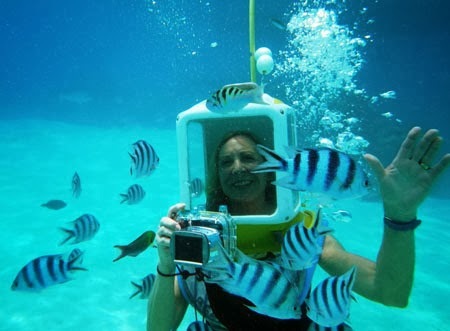 If you can’t get to Bora Bora, many Caribbean ports also offer helmet dives. Did it feel claustrophobic at all? No. 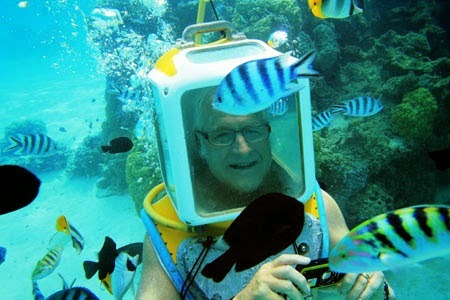 The helmet is put on just before you submerge. Then we were able to walk freely through the water (within a specified area because of air hoses attached to the boat). The water was clear and brightened by sunshine from above.